SoundWaves, the Hilton Head Symphony Orchestra’s new rehearsal and performance venue in the Coligny area, soon will have a new performance lighting system thanks to a new lease with the Town of Hilton Head Island. Hilton Head Island said goodbye to historian Lou Benfante on March 9. Benfante was best known for his efforts to preserve, protect and showcase the history of Hilton Head at the Heritage Library’s History & Ancestry Research Center. 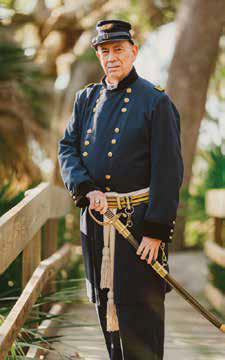 As board president of the nonprofit group, he helped create the Revolutionary War History Park planned for the land around St Luke’s Parish Zion Chapel of Ease Cemetery, scheduled to break ground in 2026. 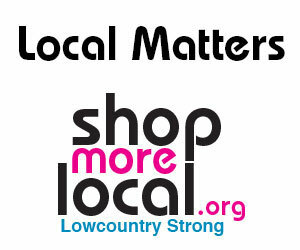 One of the best thing about where we live is how giving our community is. Has your business or organization given back to the community? 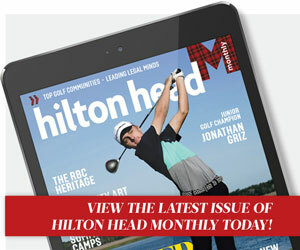 Submit your photos to editor@hiltonheadmonthly.com for this section. Space is limited. Now in its ninth year, the Heritage Classic Foundation’s annual Plaid About Reading program, presented by Future Scholar, has has hit a record number of entries. Twenty-one elementary schools from Hilton Head Island to Charleston participated in the Plaid About Reading program Feb. 4-15 for a chance to win Heritage tickets and money for their schools and to meet PGA Tour golfers. The lighthearted scholastic competition gives area elementary school students in grades kindergarten through fifth a chance to win $500 for their school, $150 for their class, tickets to the RBC Heritage Presented by Boeing and the chance to meet a professional golfer at Coca-Cola Youth Day, held the Tuesday of tournament week. Hilton Head Island residents shouldn’t spend too much time looking for new Mayor John McCann at Town Hall. His sparse office, dominated by a meeting table and the emblem of his beloved New York Yankees emblazoned on the wall, signals that the mayor does not plan to spend much time there. Low-cost Allegiant announced early Tuesday that it plans to add nonstop flights from Savannahto two more cities starting June 6. The seasonal flights will connect Savannah-Hilton Head International Airport to Albany, New York, and Providence, Rhode Island.Introductory fares will be as low as $49 each way, according to a news release from Allegiant. 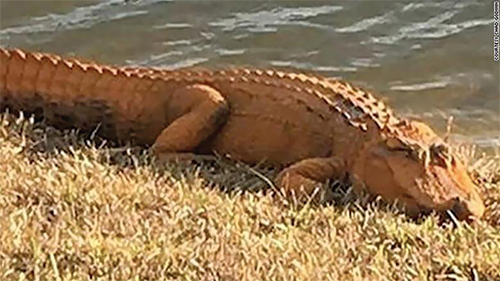 After two orange alligators were spotted in Bluffton last month, local residents worried that the alligators’ carrot color were a sign of pollution. But experts at the S.C. Department of Natural Resources said the unusual hue was probably due to alligators hibernating somewhere near rust, like by an old drainage pipe. Alligators typically emerge from hibernation in February. Once they spend some time away from the source of the rust, their coloration will fade back to normal. Town Council members inducted Mayor Lisa Sulka into the town of Bluffton’s Wall of Honor in February. Sulka, the town’s first female mayor, was nominated because she epitomizes the town’s slogan, “Heart of the Lowcountry.” She led the town’s economic development charge as she partnered with Clemson University in 2012 to create the Don Ryan Center for Innovation, the first business incubation center in a non-metropolitan area of South Carolina. Sulka is also a strong advocate for Bluffton’s youth. She says she hopes her actions, whether it is writing recommendations to colleges for students or helping them with their applications or just reminding them that Bluffton’s adults are rooting for them, have made an impact on their lives. The Wall of Honor is located adjacent to the Charles E. Ulmer Auditorium in Town Hall. Turn off your lights at 8:30 p.m. March 30 for an hour to express solidarity with environmental conservation efforts around the world. Earth Hour was started as a lights-off event in Sydney, Australia, in 2007. Since then, it has grown to include events in more than 180 countries and territories worldwide. People who participate often host candlelit dinners, go stargazing, throw Earth Hour parties or simply switch off their lights for an hour. Learn more by following the hashtag #Connect2Earth. One of Bluffton’s original grocery stores, The Rate at 45 Bridge St., will undergo restoration to its former condition. New owner Debbie Wunder bought the property last year and plans to restore the now-dilapidated building to honor the town’s history, architecture and preservation efforts. Bluffton’s Developmental Review Committee is currently reviewing her plans. The widening of Interstate 95 from Yemassee to Georgia will include six additional driving lanes to alleviate road congestion. State transportation officials approved the project, which will cost more than $1 billion, with work expected to begin in 2023 at the earliest. Additionally, more than $25 million in funds will be allocated to fixing 30 roads in Beaufort and Jasper counties. The 10-year SCDOT plan will be funded by a 2017 statewide gas tax increase. The town of Bluffton closed on the purchase of a 37-acre parcel located at 200 New Riverside Road in December. This property, commonly known as the New Riverside barn property, includes the iconic 2,700-square-foot barn visible from the highway. The sales agreement also included the donation of a 7-acre parcel located at the southeastern intersection of S.C. 46 and S.C. 170, made possible as a result of a successful strategic partnership with Palmetto Bluff. These properties are expected to be used as civic space. The parcel was purchased for $200,000. Hilton Head Island Town Council recently named 13 local residents to serve on the new Hilton Head Island U.S. 278 Gateway Corridor Committee. The committee will work with the South Carolina Department of Transportation as it plans improvements along U.S. 278 from the intersection of Moss Creek Drive to the intersection of Spanish Wells Road. Ben Hughey has always been an animal lover. Beyond his love of music — he’s the lead singer and guitarist of Naytiv — it’s the thing the Hilton Head Island teenager is perhaps best known for. On his Facebook page, he even posted a photo showing the image of a cat’s face over his heart. So when a friend noticed a stray cat wandering around the NAMI parking lot on the island’s north end, Hughey was the first person to come to mind to help. Last year, the Trump administration issued permits to five private companies to use seismic testing to map out oil and gas deposits along the Atlantic coast, creating some unexpected political bedfellows in South Carolina. U.S. Rep. Joe Cunningham, the first Democrat to flip a South Carolina congressional seat in three decades, announced Jan. 8 that he will revive a measure to ban offshore drilling for 10 years first introduced by Mark Sanford, his Republican predecessor. The bill languished in committee under GOP House leadership. The Public Art Fund of Community Foundation of the Lowcountry has announced the winners of the 2018 Public Art Exhibition’s People’s Choice and Purchase Prize awards. More than 1,000 votes were cast for the People’s Choice Award. Artists for the top three vote-getting pieces receive a cash award. First place went to Sarah Edwards’ “Botanical Fainting Couch,” a cast bronze “couch” made of alphabet letters imprinted with plants. Second place went to “Hilton Head to the Moon” by William Bennett, and third place went to “Beach Umbrella” by Casey Schachner.